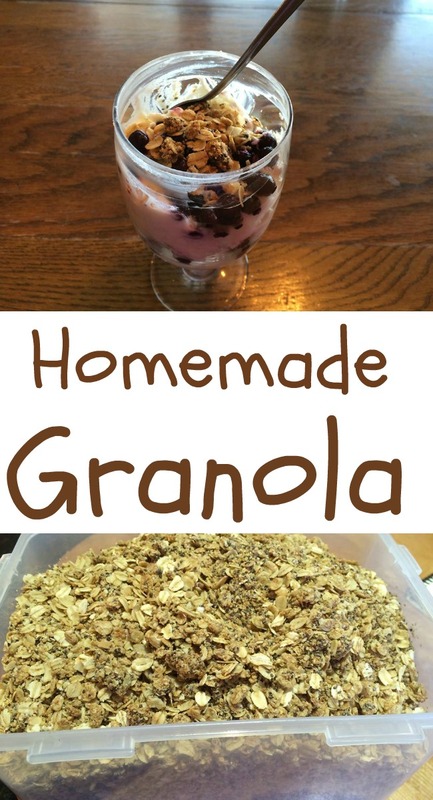 There are so many recipes for granola out there, and you can pretty much pick and choose what you want to put in yours. Since I don’t care for coconut and I’d like to stay away from carbs like those in Rice Krispies, I came up with my own combination that works for me. 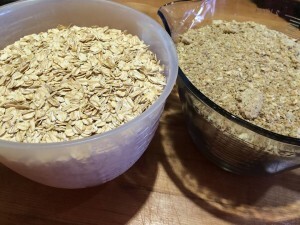 One of the benefits of granola is that it works as a cathartic. So if you need help being regular, this is a good recipe to use. I added a new ingredient to this recipe and it’s new for me this time. I found Chia Seed in the grocery and noticed that it was an Omega 3, which supports cardiovascular health. While some studies are inconclusive, there is no doubt in my mind that this seed can be helpful in healthy nutrition. 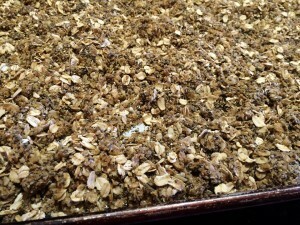 In the photos, you’ll notice dark specks in this batch of granola (almost like tiny poppy seeds). That is the Chia seed. 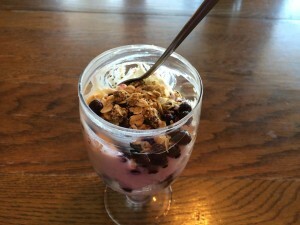 You don’t have to add any to your granola; I decided to try it because of my age and other health issues. I know it certainly can’t hurt. So for this recipe, I am listing this ingredient as optional. I like eating granola on top of other cereal (it really fills me up) and also on top of yogurt with fruit. There are other ways it can be used as well. You can also use it in place of bread crumbs for stuffing, use it as a breading for chicken (blend in a blender first), eat it with fruit as a snack, or eat it as a cereal with fruit and milk. You can also use it as a topping for baked apple pie! I’ve eaten it on top of oatmeal for a real cathartic boost. on top of oatmeal for a real cathartic boost. Other fruits that could be added to this recipe are raisins and cranberries. You can always just add these fruits to the recipe once it is complete. That way, whoever uses the granola can choose his own choice of fruit. I put my almonds and sesame seeds in a blender. 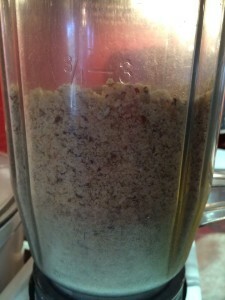 If the flax seed I have is not ground, I add that in the blender also. 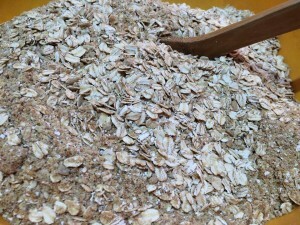 Next I add the oat bran, wheat germ, and the seeds together, mixing them really well. Then all I need to do is mix the pre-measured oatmeal with this mixture. Mix the sauce with the dry ingredients. 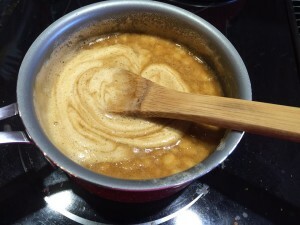 I pour my sauce over the dry mixture; then I add a littlee dry mixture to the kettle so I am sure to get all the sauce mixed in. Spread the granola onto a tray and sprinkle with cinnamon (unless you’d rather skip the cinnamon). Put the trays into the oven and bake. 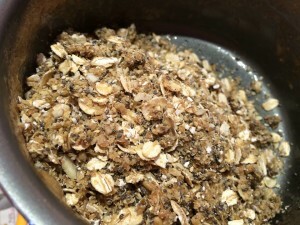 Remember that the dark seeds you see in the granola are Chia seed. If you skip this ingredient, it will look different. I like to store my granola in a Lock & Lock container. I love these containers because they have square corners and don’t waste space. 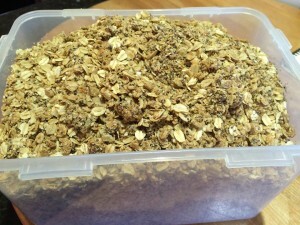 I like being able to see what is in the container and how much is left so I can plan my next batch of granola. 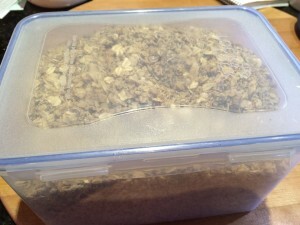 It gives a tight seal, and I’ve stored granola like this for at least two months at a time, even in the humid summer. Plus, the lid is easy to lock and to remove. So now, here is the recipe. An easy topping for yogurt, ice cream, salad, or cereal, this recipe is simple to make and easy to store. Super Bowl 50 – Who Got Sacked?